Imagine not being able to work, play sport or socialise. There are many people in our community who feel excluded from enjoying these things which most of us take for granted. More than 7,000 adults in Cumbria have a learning disability and a large majority do not take part in sport or physical activity. Carlisle Mencap’s Activate Sports Development Programme is designed specifically for people with learning and physical disabilities. It uses sport to develop physical and social skills, promote self-esteem, improve physical wellbeing and general health, and empower people with a learning disability to be more confident and happier. 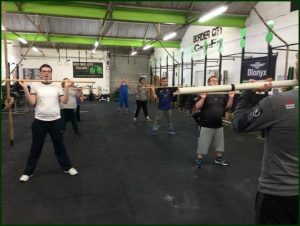 People who have felt hampered by their disabilities can get involved in team sports such as football, weekly gym sessions at Carlisle Youth Zone, CrossFit exercise classes and a monthly pool night. One young man who is autistic was initially extremely anxious, unsettled and reluctant to join in. Over a year, with encouragement, guidance, and a routine, he became an integral part of the group, enthusiastic and noticeably fitter. Over 40 members have benefited from the project, increasing their social circle and now feel included in mainstream activities outside of their comfort zone. The project received more than £10,000 from the Cumbria Fund, the Cumbria Young People’s Fund, the Thomas Graham Grassroots Grants Fund, the Cumbria Industries Amenities Fund and the Johnson Fund. For more information on all the funds see our Grants page.